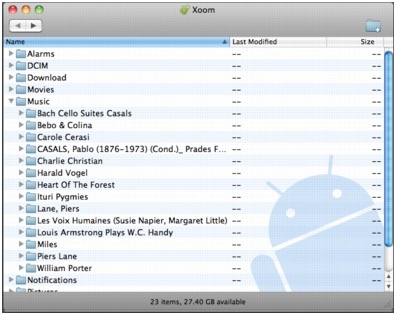 Have an Android phone or tablet that you want to transfer files and movies to and from your Mac with? Maybe you got a new Kindle Fire that is freshly rooted, and you’re looking to move some of your own movies and pictures to it? No sweat, there are some really easy ways to do this, one of which is Google’s free Android File Transfer app, which is compatible with almost every Android smartphone or tablet out there. By far the simplest solution for Mac users to move files between Android devices and any sort of Mac, Android File Transfer (AFT) works very similarly to a standard FTP program, without the login, and it provides a simple interface for accessing and modifying items on the Android device, making it a virtual no brainer to use. Creating new folders with AFT is just a matter of clicking the little folder icon with a plus on it, and you can use the arrow keys to move forward and backward. Renaming files is the same as native OS X, just click into any file/folder and hover with the mouse cursor until it becomes changeable. The app has full drag & drop support, so you can copy things from just about anywhere in the Finder, or even transfer them from apps that also support drag and drop. After it has been used and setup once, subsequent connections between the Android to the Mac will cause the app to automatically launch, you can adjust that in the settings though if you would rather it not auto-launch. This app does the job with ease, and the only real limit is a 4GB file size limitation for transfers, that is due to Androids file system which uses FAT32 for it’s storage portion. A huge benefit to the FAT32 file system in use is that it can be accessed from Mac OS X, Windows, and Linux, without any modifications, giving access to files from just about any computer imaginable. Do note that if you’re using this app for image and photo management, there are better ways of moving pictures from an Android smartphone to a Mac, and the best way is to basically treat it like a camera as described here because it will give you thumbnails of each image and the entire importation process is handled for you. Android File Transfer says “No Android device found”, now what? Everything should now work as intended. If that doesn’t work and you still see the error message, it usually just indicates that the app isn’t compatible with the device you’re trying to use it with, which means it’s not even necessary with that specific Android device. Instead, it can be mounted as if it was a disk drive like any other USB storage device, allowing you easy access to files through Finder without the need for the Android File Transfer app at all, something which is increasingly common with devices from certain manufacturers like HTC, and with smartphones that have storage expansion options. If you opted out of the iOS route, AFT and WinAmp for OS X will make your Android & Mac life easier, since you can move files and documents around easily, and even sync your iTunes collection to the Android device with WinAmp. Don’t forget you can also easily sync the important stuff like Calendars, Notes, and Mail between Macs and Android smartphones too, a process which is also quite simple to configure. Happy Androiding! Shouldn’t this work without rooting the Fire? It’s Android after all? Don’t know why, but it doesn’t work. I’ve tried other similar apps like AirDroid and AirMore. They are fine. Did I do something wrong? Android File Transfer works perfectly to transfer files from a Mac and Android, there is no other option that works as well or that is not some weird app. If you know of a better one, let us know because I use AFT. For samsung galaxy s2 user only.Try this… After installing the android file transfer software. Then go to phone settings>wireless and network>more>USB utilities> then press ” connect storage to pc”, then connect the USB cable to pc or Mac. Then click the USB mass storage. Wait for a sec, then your hard drive phone will appear on screen. perfect. After looking for two days, this finally solved my issue. Hahah this is a hilarious stick figure. I tried it out and really had a good laugh after. Seriously, my kids will surely love to try this Draw A Stickman figure too. Thanks for sharing! does not work anymore with OSX 10.8 and Samsung Galaxy Nexus. I’ve been trying to find a way to transfer my files from my Android and MBP. I have a Galaxy Nexus and I will have to connect MTP. Is there a more RELIABLE source?!?! Seriously. This sux big time! Picasa cannot import photos? There’s no FUSION support for the Android filesystem? I have to use a cranky tool to move files to and from my Android phone? Android guys, think it over again pls! Wow, seems I have another option for wireless file transfer! I used to employ Web PC to do the job for me. So, would rooting my Android phone make this file transfer business easier? But, i ever see problem when launched Android Transfer File on my MacBook Pro. Anda now, i use Wi-FI and ShareIt App to transfer all my files from Android device to MacBook Pro and iPhone.